Local press seems to be indulging in pre-election self-censorship as they publish that crime increased by thirteen per cent across Greater Manchester rather than publishing Oldham’s crime statistics. Figures were released by the Office for National Statistics on Friday and reveal that in the 12 months to December 2014 many crimes in Oldham showed a huge upward trend with amongst others a very worrying 54.7% increase in “sexual offences”. 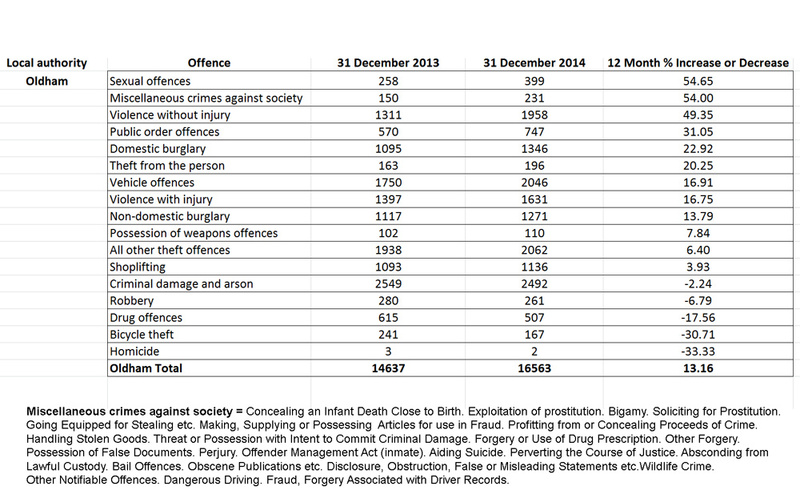 Here are the full Oldham statistics below that the powers that be clearly do not wish to be public knowlege.